Hanover Engineering developed a Master Plan for Trout Habitat Improvement along Paradise Creek in Monroe County for the Brodhead Forest and Stream Association. 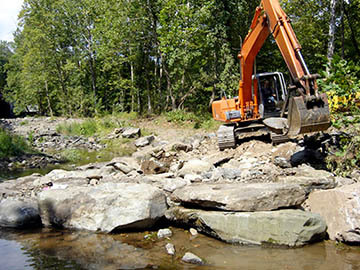 During plan development, Hanover Engineering completed the design and permitting required to install five new trout habitat improvement structures at one of the priority locations identified by the Association. The new structures were then constructed using large boulders needed to withstand the high flow velocities of Paradise Creek, and included one Rock Vane, one Rock Cross Vane, two Stone Deflectors, and Random Boulder Placement. High streamflow volumes and velocities in Paradise Creek, following installation, have already begun to improve trout habitat conditions within the vicinity of the new structures. Careful planning and design allowed for streamlined permitting and minimized impacts to the stream for installation. The entire project was completed under Statewide General Permit No. 1 – Fish Habitat Improvement.